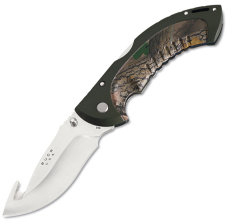 Folding Omni Hunter 12 PT., Green Camo Handle, Guthook, Pl. Full-size, heavy-duty, ergonomic design. Popular hunting knife in a folding version featuring Sandvik steel and a mid-lockback design.